This list of tallest buildings in Toronto ranks skyscrapers in the Canadian city of Toronto, Ontario by height. The tallest structure in Toronto is the CN Tower, which rises 553 metres (1,814 ft). The CN Tower was the tallest free-standing structure on land from 1975 until 2007. However, it is not generally considered a high-rise building as it does not have successive floors that can be occupied. The tallest habitable building in the city is First Canadian Place, which rises 298 metres (978 ft) tall in Toronto's Financial District and was completed in 1975. It also stands as the tallest building in Canada. The history of skyscrapers in Toronto began in 1894 with the construction of the Beard Building, which is often regarded as the first skyscraper in the city. Toronto went through its first building boom in the late 1920s and early 1930s, during which the number of high-rise buildings in the city vastly increased. After this period, there was a great lull in construction between 1932 and 1964 with only a single building above 91.5 metres (300 ft) tall being built. The city then experienced a second, much larger building boom, which was at its peak between 1967 and 1976. This period saw the construction of Canada's three tallest buildings and 6 of its top 10 (at the time). When topped off in 1967, the TD Tower was the 14th tallest building in the world. The TD Tower would soon be followed by Commerce Court West, the 14th tallest building in the world at the time of its completion in 1972. Later, Canada's current tallest building, the First Canadian Place, became the sixth tallest building in the world at the time of its completion in 1975. After the mid-1970s, the pace of the boom slowed considerably but continued onto the early 1990s, culminating with the construction of the city's and Canada's second and third tallest buildings: Scotia Plaza and the TD Canada Trust Tower. After this boom, the city went through a third, shorter lull in construction from 1993 to 2004, in which the city added only one new building to its top 20. By 2005 however, the city's third and largest high-rise construction boom began with the completion of One King Street West and has continued unabated ever since with nearly 50 planned, under construction or recently built buildings over 150 metres (490 ft) tall. 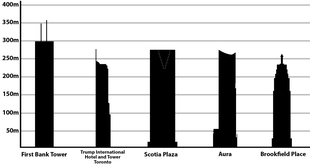 Of the 20 buildings in Toronto taller than 200 metres, only six were built prior to 2000. In 2012, The St. Regis Toronto (then known as Trump International Hotel and Tower) was completed, with a top dome height of 252 m (827 ft) and an antenna height of 277 metres (908 ft), making it the fourth-tallest structure in Toronto and all of Canada. With the completion in late 2014 of Aura—which, at 78 storeys and a height of 272 m (892 ft), is the highest residential building in Canada—the tallest building under construction is the 308-metre (1,005 ft) tall The One. Natalie Alcoba of the National Post described this phenomenon as the "Manhattanization" of Toronto. In one week of 2018, Toronto's city council approved 755 storeys of new development in the city's downtown core. The Toronto skyline can be spotted by the naked eye during clear daylight skies from locations as far as Newmarket in the north, Clarington in the east, Hamilton in the west, and Fort Niagara State Park, which is situated southeast of Toronto across Lake Ontario in the American state of New York. As of March 2019, Toronto has constructed 60 skyscrapers and has a further 27 under construction and most of those should be built by 2022. Toronto also has 69 skyscrapers that are either approved or in the proposal stage. Toronto currently ranks 16th in the world with most skyscrapers already completed, 3rd in North America and 1st in Canada and ranks 7th in the world with the number of skyscrapers under construction. There are 60 skyscrapers in Toronto that stand at least 150 m (492 ft) ranked by standard height measurement as of January 2019. This includes spires and architectural details, but does not include antenna masts. An equal sign (=) following a rank indicates the same height between two or more buildings. An asterisk (*) indicates that a building has been topped out, but not completed. The "Year" column indicates the year in which a building was completed. Freestanding observation and/or telecommunication towers, while not habitable buildings, are included for comparison purposes; however, they are not ranked. One such tower is the CN Tower. Skyscrapers and other structures may also be measured based on their pinnacle height, which includes radio masts and antennas. As architectural features and spires can be regarded as subjective, some skyscraper enthusiasts prefer this method of measurement. Standard architectural height measurement, which excludes antennas in building height, is included for comparative purposes. There are 27 buildings under construction in Toronto and are planned to rise at least 150 m (492 ft) as of January 2019. A building is officially listed as Under Construction when the construction crane is installed. 1 The One 306.3 / 1005 83 2022 Once completed, it will surpass First Canadian Place — Canada's current tallest skyscraper and become Canada's first supertall skyscraper. Construction officially began with a groundbreaking ceremony on October 5, 2017. 2 CIBC Square I 237.8 / 780 49 2020 Construction officially began with a ground breaking ceremony on June 21, 2017. 4 Sky Tower Eau du Soleil 228.2 / 749 66 2019 Upon completion — Canada's tallest building outside a central business district. ^ "CN Tower web site". Archived from the original on July 23, 2007. Retrieved September 26, 2007. ^ a b "First Bank Tower". Emporis.com. Retrieved June 9, 2016. ^ a b "The Beard Building". Emporis. Retrieved February 18, 2008. ^ a b "Trump International Hotel and Tower". SkyscraperPage. Retrieved September 24, 2011. ^ Alcoba, Natalie (August 27, 2014). "Toronto's 'Manhattanization': Downtown development growing at 'mind blowing' rate". National Post. Retrieved June 28, 2015. ^ "Toronto is experiencing a 'Manhattanization' of its downtown core" – via The Globe and Mail. ^ "Number of 150m+ Completed Buildings - Toronto". Skyscrapercenter.com. Retrieved March 12, 2019. ^ "CN Tower". Emporis.com. Retrieved March 14, 2008. ^ a b "CN Tower". SkyscraperPage. Retrieved March 13, 2008. ^ /?buildingID=34 "First Canadian Place" Check |url= value (help). SkyscraperPage.com. Retrieved February 18, 2008. ^ "Commerce Court West". SkyscraperPage.com. Retrieved February 18, 2008. ^ "Scotia Plaza". SkyscraperPage.com. Retrieved February 18, 2008. ^ "TD Canada Trust Tower". SkyscraperPage.com. Retrieved February 18, 2008. ^ "Toronto-Dominion Bank Tower". SkyscraperPage.com. Retrieved February 18, 2008. ^ "Ritz-Carton Toronto". Retrieved September 24, 2011. ^ "Bay Wellington Tower". SkyscraperPage.com. Retrieved February 18, 2008. ^ "Number of 150m+ Completed Under Construction - Toronto". Skyscrapercenter.com. Retrieved March 12, 2019. ^ "Temple Building". Emporis. Retrieved February 18, 2008. ^ "Trader's Bank Building". Emporis. Retrieved February 18, 2008. ^ "Canadian Pacific Railway Building". Emporis. Retrieved February 18, 2008. ^ "Optima Business Centre". Emporis. Retrieved February 18, 2008. ^ "Sterling Tower". Emporis. Retrieved February 18, 2008. ^ "Royal York Hotel". Emporis. Retrieved February 18, 2008. ^ "Commerce Court North". Emporis.com. Retrieved February 18, 2008. ^ "Toronto-Dominion Bank Tower". Emporis.com. Retrieved February 18, 2008. ^ "Commerce Court West". Emporis.com. Retrieved February 18, 2008. Wikimedia Commons has media related to Skyscrapers in Toronto. This page was last edited on 25 April 2019, at 13:49 (UTC).